I‘ve heard many people say they love the look of hardwoods, but don’t want the maintenance. Maybe I’m weird, but I actually find hardwood floors quite easy to maintain. Or maybe I just enjoy cleaning them for some reason, I don’t know. Today I thought I’d share some of my floor cleaning tips and the tool I like to use to keep our hardwoods clean and pretty. Our floors don’t really require much upkeep, fortunately the beautiful multi-tone grain does a pretty good job of hiding dust and grime so I don’t feel like I’m a slave to cleaning my floors. But in order to protect your wood floors, it is important to keep them swept. Especially if you have little rocks outside that might be tracked in and scratch the wood. It is also a good idea to keep your floors dusted, not only for your own health and safety (dusty floors are slippery!) but just because the floors look so pretty when they are free of dust. The dark stained hardwoods in my old house required daily dusting to look their best (my Hickory floors aren’t as demanding of the daily dusting and for that I’m grateful). I’ve been using washable cloth dust mops for years. Perhaps disposable dusters would work, too, but I really like my duster because it works really well for large areas of wood flooring. You can see my duster in the picture above (where Jack is looking at it like it is a long lost cousin or something haha, he really has a fascination for all fuzzy things). 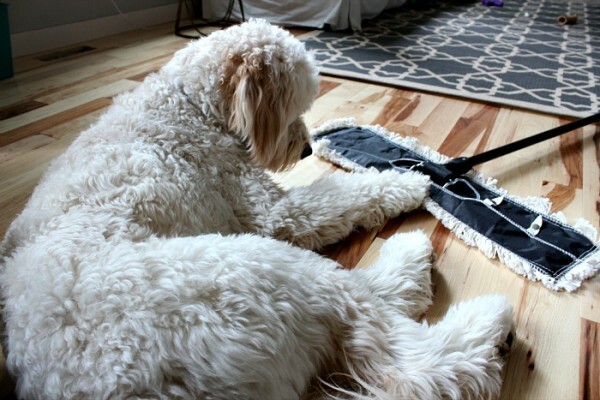 The dust mop has a pivoting handle on it so it easily glides around the room and into corners. It can be removed for washing, so you can reuse it for years! I also use a regular dust rag for quick hand-dusting of my stairs. I just run a cloth (using a little Bona if they need to be cleaned) over each one to keep them looking fresh and pretty. It takes just a minute to do the entire stair case. I would much rather dust by hand than lug a vacuum up and down a staircase. Speaking of vacuums, I would be very careful about vacuuming a wood floor because the rotating brush or wheels can scratch and damage your floor. I have a canister style Dyson and sometimes I just carry it around and gently use the hose to quickly grab dust and debris from corners. 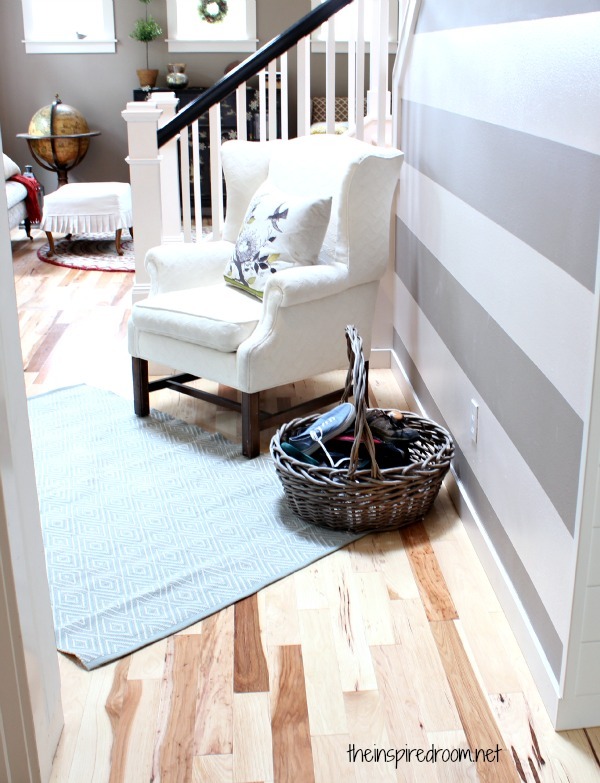 Our wood floors also have a special stain resistant finish on them so spills don’t easily soak in and stain. That means I can easily wipe up spills from the surface with a paper towel or rag before any damage might occur. We never use water to clean our floors. 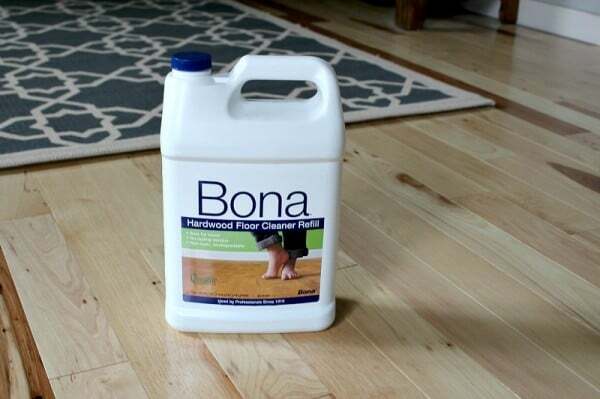 To clean and protect the wood we use Bona hardwood floor cleaner with a dry mop. We keep a spray bottle of Bona under our sink for quick clean ups. To save money, we buy the larger refill containers and just fill our spray bottle as needed. Last tip? Notice how Jack kind of matches our floors. If you have a pet that sheds (Jack doesn’t shed much but still, hair does end up on the floors), it is much easier to maintain the feeling of clean floors if you do NOT have a black animal and light floors, or a white animal and dark floors. Am I right? So, I want to know: Do your pets match your floors? This post concludes my six part series on hardwood floors. 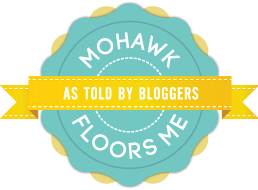 I’m partnering with the “Mohawk Floors Me, as Told by Bloggers” program and received hardwood flooring as a part of the project, but as always, all opinions, experiences are my own.